As it turns out, our new corporate masters at Con-Way take Sunday’s off here in Greencastle, PA so I’ll be waiting for a day at a nearby truck stop. I got up early, as usual, and made my way south through Chicago then out the east side along the Indiana toll road and into Ohio, ending the day just inside Pennsylvania. I wasn’t out of driving hours but I just didn’t feel like pushing any further today. I will finish out the last couple hundred miles tomorrow morning then see what fun my corporate masters have in store for me. After my second drop this morning my trailer was empty. Well, nearly empty. 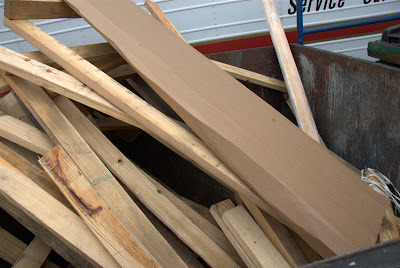 You see, the 31,000 pounds of glass windows that were offloaded from said trailer were held in place by hundreds of pounds of dunnage (dunnage is a term used to describe things that hold cargo in place, like straps, chains, lumber, rope, etc.). In this case, probably 400 pounds of brand new pine 2×4’s of various lengths and perhaps a hundred pounds of cardboard. It turns out the consignee for the second part of the load didn’t want any of this stuff so they left it for me in the trailer, which I took to Franklin, Wisconsin for my next pickup. Before I dropped that trailer I had to clean it out, which meant finding a home for all of this scrap wood and cardboard. I asked the local Con-Way folks for whom I will shortly be hauling a load if they had any need for this stuff and they said nope, go thataway to the dumpsters and take care of it. That particular dumpster was empty when I began. 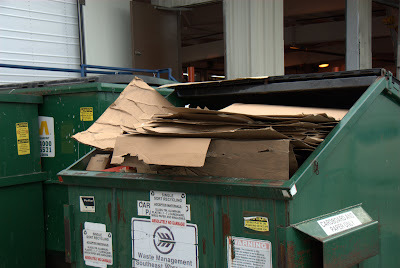 The cardboard from the load fit into this dumpster. All told it was another hour or so of unpaid work to take care of this. I’m very thankful it was an overcast day and only about 80 degrees out. If the temperatures were extreme it would be quite a miserable job. When I departed I had to back up at least 300 feet around a corner then make a very tight left turn to head back out the muddy parking lot. Glass windows and doors, of course. 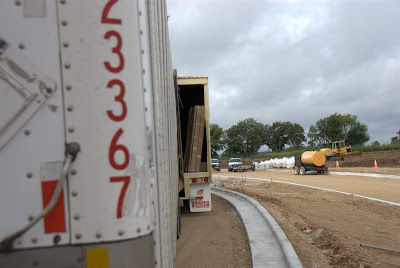 I delivered a small part of the shipment first thing this morning in Waunakee, Wisconsin then moved about 15 miles away to the township of Cottage Grove to unload about 15 tons of windows for the new middle school that is very much still under construction. This load is unusual because while there are only two stops, there are four Bills of Lading — two for each stop. The first part was because the packages were going to two different job sites, but all of this load is going here to this middle school, so I wonder why they bothered using two bills. Another first: The trailer will not be unloaded to a dock or to the ground, but instead to the back of a storage trailer on site, where they can get to the windows as they go to install them. This morning I left central Missouri and made my way through St Louis and up through Illinois to just inside Wisconsin where I fueled and parked at the Pilot in Beloit. This particular Pilot is one of the more screwed up ones, as far as parking goes. The parking lot is set up in the shape of a “U” with an entry point for the fuel island and the other end being the exit. Among the problems at this particular location is the fact that the entryway to the fuel island has a sidewalk that runs wayyyy too far down the entrance so making it in is difficult, at least if you want the pumps closest to the main building. Worse, people enter from the exit ramp to avoid the backlog at the pumps which causes delays. 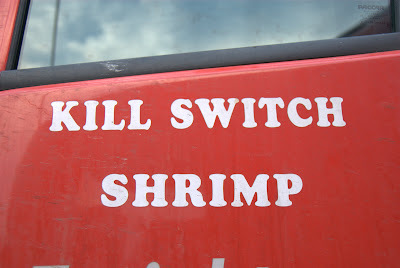 Worst, anyone backing in to almost any slot at the entire truck stop brings traffic to a halt. The only reason I use this particular pilot is because there is a Walmart down the block and I needed to pick up a few things I forgot to get on the truck when I was in Joplin yesterday. 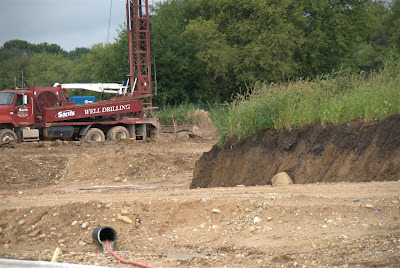 Tomorrow I deliver at two job sites (translation: places being built, usually) which is always an adventure.